Shock Cord is comprised of top quality rubber, which makes it compact, stable and durable. These cords are suitable for a variety of applications from tethering tools to your harness to tying down gear. The outer cover is made of extremely abrasion-resistant polyester, which completely protects the inner rubber core. WARNING: These cords are not intended for climbing, jumping or rappelling. 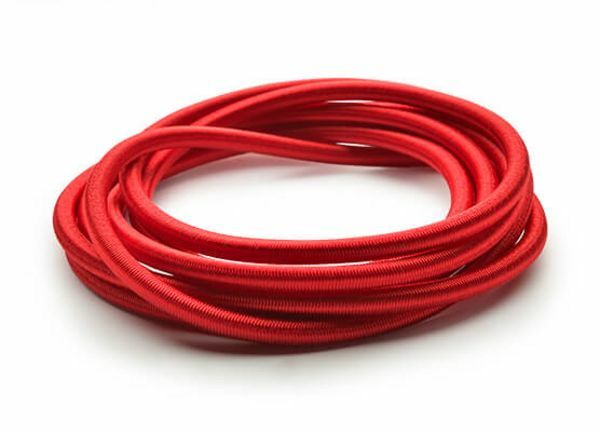 TEUFELBERGER’s Shock Cords are made of top quality rubber core overbraided by a polyester cover. The rubber makes the shock cords compact, stable and durable. The extremely abrasion-resistant polyester sheath completely surrounds and protects the inner rubber core. These elastic Shock Cords can be used in a wide variety of applications where stretch and elastic retraction properties are needed; examples include tethering tools to your harness and tying down gear. These cords come in 3mm through 10mm diameters in a variety of lengths and colors. WARNING: These cords are NOT intended or certified for life safety applications and are not to be used for climbing, jumping or rappelling.